A look at participation in the 3 dozen most-ratified U.N. treaties shows the United States to be on the inside nearly twice as much as it’s out. But oh, those on-the-outs treaties. 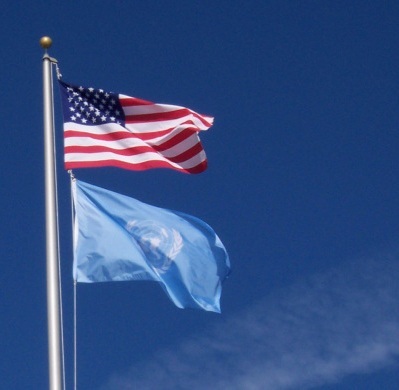 During this week’s General Assembly sessions, the United Nations set aside 3 days for a “Treaty Event,” in effect an open house where countries are encouraged to sign, ratify, accede, and otherwise show their support for any and all of the many multilateral conventions for which the United Nations serves as depository. Compilation of Tuesday’s joinder activities here; Wednesday’s activities here; Thursday’s here. The next such Treaty Event is set for September 30 and October 1, the last couple days of the Assembly’s general debate. 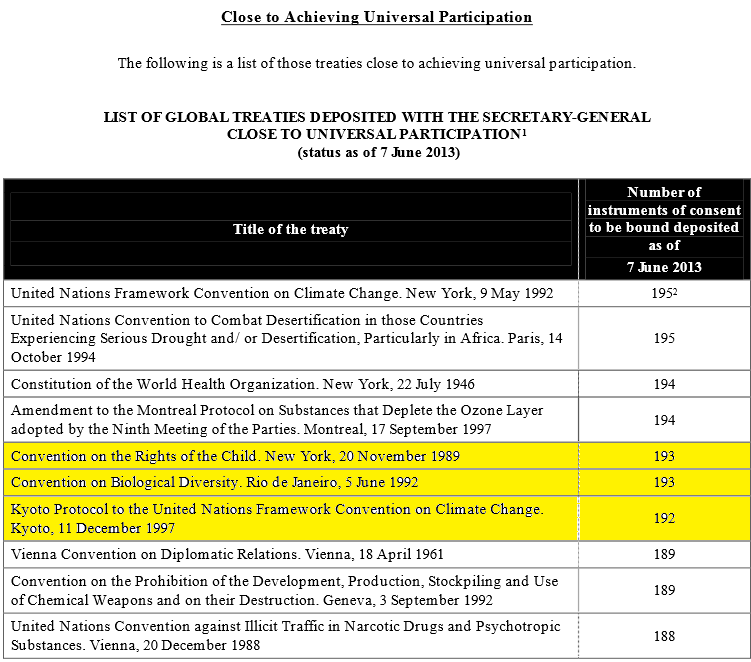 Countries were nudged toward the 36 treaties closest to universal – that is, 100% – participation. (Treaties deposited elsewhere, such as the four Geneva Conventions of 1949 and their protocols, weren’t part of the event.) Oldest on the United Nations’ list – set forth in full at the bottom of this post – is the Convention on the 1946 Privileges and Immunities of the United Nations, which enjoyed 159 parties as of the June 2013 list-compilation date; youngest is the 2003 U.N. Convention against Corruption, with 167 parties. 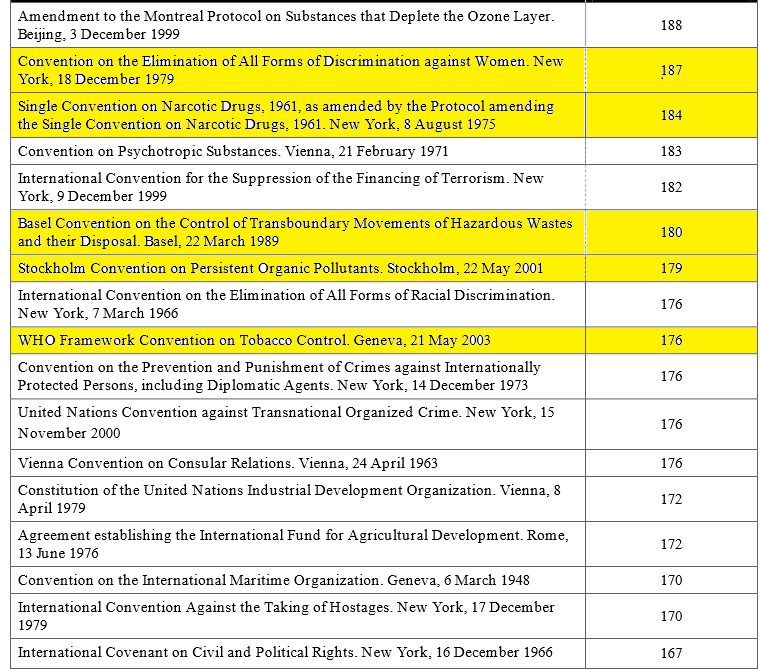 Tied for the top spot, with 195 parties, were the 1992 U.N. Framework Convention on Climate Change and the 1994 U.N. Convention to Combat Desertification in those Countries Experiencing Serious Drought and/or Desertification, Particularly in Africa. 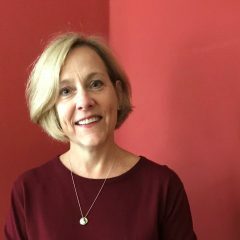 A treaty worth noting that fell just below the most-ratified cut: the 2000 Optional Protocol to the Convention on the Rights of the Child on the Involvement of Children in Armed Conflict, which has 152 parties, one of which is the United States.